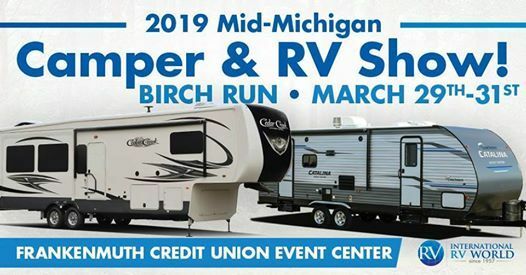 Join us at the Frankenmuth Credit Union Event Center (formally Birch Run Expo Center) for the 2019 Mid-Michigan RV & Camper Show! 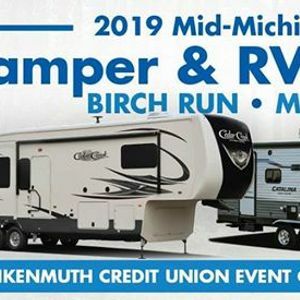 Browse a huge selection & even bigger savings on new Motor Homes, Fifth Wheels, Toy Haulers, & Travel Trailers. With units ranging from 14’ to 41’ there's something for everyone! Manufacturer reps will be available SLASHING PRICES and answering all your questions Saturday & Sunday. Including reps from: RPOD, Surveyor, Sandpiper, Cedar Creek, Winnebago, Crossroads, Catalina, and Viking. ?And affordable financing will be available on-site throughout the show! Stop Dreaming, Let's Go RVing! 3 non-perishable food items or cash contribution, all of which will be donated to Good Samaritan Rescue Mission.